UPDATE (March 6, 2009): This internship has been filled. See dancingrabbit.org for other opportunities in the neighborhood. Interested in straw bale house construction? Want some hands-on experience with natural building? Want to experience community life on an off-grid homestead? If your answer is “yes” to these questions, then this internship opportunity may be for you. Red Earth Farms is an intentional community of homesteaders located on 76 acres of pastoral rolling hills in northeastern Missouri. We have in common a commitment to developing sustainable lifestyle skills such as local food production, permaculture and natural building. We’re looking to host interns during the 2009 building season (April-September) to help with our straw bale house. The building is based on current best practices in natural building and passive solar design. It has round pole post-and-beam framing and a cement-free rubble trench foundation. 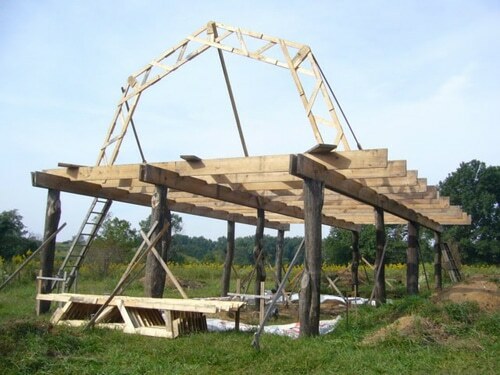 It features an earthbag stem wall, strawbale walls, and a pallet truss gambrel roof. It will be finished with a poured adobe earthen floor and earthen and lime plasters. Camp style. We have great tent sites and a couple of small cabins that may be available. We eat meals together as a community in our outdoor kitchen. Our meals are mainly vegetarian, and you will be included in the cooking rotation as soon as you feel ready. We have two other intentional communities in our neighborhood. Sandhill Farm is a 30-year-old egalitarian community, and Dancing Rabbit is a 10-year-old ecovillage with forty-plus members. We have a tri-community potluck dinner once a week. You need to have a good work ethic and be capable of physical labor. It would be great if you have some building experience but it’s not required. We will choose interns with the best overall fit for the program. You’ll be working directly with an experienced natural building teacher and learning alternative building techniques. You’ll be eating with our food coop and all of your meals will be covered. You’ll get a place to camp or a cabin to stay in. We have a great swimming pond and a solar shower. You can use our wireless Internet, powered by wind and sun. You’ll get exposure to three intentional communities and access to our collective knowledge in the areas of growing food, permaculture, consensus decision making and community living. 30-35 hours of work per week, a good attitude and enthusiasm for learning. You’ll also need a way to get here and to wherever you’ll be going when you leave. Transportation from a train bus station in the area can be arranged. This is a unique opportunity to get a bunch of natural building experience without paying for it. If you stick around long enough you could learn everything from earthen floors on up to finish plasters. The list of things you will be exposed to is broad: earthbags, straw bales, pallet trusses, passive solar, off-grid power, permaculture, cooking, and great vegetarian meals. You may even have the opportunity to help teach workshops in natural building. Other programs like this cost thousands of dollars. I'm a 26-year-old currently living at Dancing Rabbit Ecovillage in northeast Missouri, an intentional community devoted to sustainable living and culture change. Things you might find me doing here (other than blogging) are building with natural materials, gardening, beekeeping, making cheese, candlemaking, and above all else, living simply.